White Emperor City or White Emperor Temple is a favored shore excursion site for Yangtze River cruises. Located in Fengjie, Chongqing, it has a series of outstanding cultural and historical relics shown to all visitors, and also is the best place to admire the view of Kui Gate of Qutang Gorge. White Emperor City (白帝城) or Baidicheng is well-known for the story of Liu Bei (刘备) entrusting his sons to Zhuge Liang (诸葛亮), and is a very popular shore excursion for Yangtze River cruise travellers home and abroad. Situated on Baidi Hill at the west mouth of Qutang Gorge in the east Fengjie County in Chongqing, Baidi Cheng has long been a place of conflict in ancient China. Besides the famous historical event of Liu Bei, visitors can also enjoy other excellent painting and calligraphic to marvel at the brilliant culture in China, hear many interesting things happened in the past dynasties, know about the folk custom of hanging coffins and so forth. More importantly, White Emperor City is the best place to appreciate the magnificent Kui Gate that is the mouth of Qutang Gorge of the Three Gorges on the Yangtze. Since according to the historical records, a lot of celebrities during ancient times have paid visits to the White Emperor City and left a large number of praised poems, this place is also reputed as “City of Poems”. And now, you can spend some hours there to enjoy the academic atmosphere and the natural landscapes. White Emperor City was firstly called Ziyang City, and during the late West Han Dynasty, Gongsun Shu (公孙述) with ambition set up his separatist regime in Sichuan. After he came to the mouth of Qutang Gorge, he saw the white fog like a dragon flying up to the sky rising from a well there. Then, he built the city and called himself “White Emperor” and named the city “White Emperor City”. Later for the conflicts between small countries, White Emperor City was destroyed. In 222 AD, Liu Bei who was the first king of Shu Kingdom, retreated in Baidi Cheng when attacking the Wu Kingdom, before he died there, he entrusted his whole country and two sons to his trusted prime minister Zhuge Liang. For nearly 2,000 years, White Emperor City has experienced a lot of changes and rebuilding, and at present, it is a place to know the inspiring history and admire the famous people in the ancient times. What to See in White Emperor City? There are rich types and numbers of highlights to see in White Emperor City. Tuogu Hall is the essence, and Mingliang Palace as well as Guanxing Pavilion is not to be missed. Furthermore, you are highly recommended to reach the top of the hill to appreciate the Kui Gate. Tuogu Hall (托孤堂) or Entrusting Orphan Hall is the most attractive place at White Emperor City. There you could see the vivid imitating scene of Liu Bei entrusting his son and whole country to his prime minister Zhuge Liang. The history has it that Liu Bei, the first king of the Shu Kingdom was defeated by the Wu Kingdome and retreated to White Emperor City. Since he became ill severely but his son named Liu Chan was too young to take over the state, he eagerly called Zhuge Liang to Baidi Cheng and entrusted Liu Chan and the whole country to Zhuge before his death. Later Zhuge didn’t rule the country as his own but educated and assisted Liu Chan sincerely, hoping his taking charge of the whole country from his father. That touching and famous story was told by generations of people and Zhuge Liang is always reputed with his loyalty and integrity. Mingliang Palace (明良殿) was originally built for memorizing Gongsun Shu who had brought good and peaceful life to local people during the chaos years. However, till the Ming dynasty, it turned to be the shrine for Liu Bei, Guan Yu, Zhang Fei, and Zhuge Liang. There in the spacious hall, you can see the colorful statues of those three historical celebrities in Shu Kingdom. However, during the Cultural Revolution period, the statue head parts of the four people were all destroyed, while those of the four eunuchs were kept well due to their exploited class. And during your visit in this palace, you could find the facial expressions of the four eunuchs are much lifelike that those of the four great persons, which tells the super outstanding carving skills of ancient Chinese people. Guanxing Pavilion (观星亭) or Observing Star Pavilion is at the yard outside of the Tuogu Hall, also in front of the Wuhou Temple at White Emperor City. Constructed with 6 cornices and 12 pillars, the pavilion looks extraordinary and imposing. According to the legend, When Zhuge Liang lead the army into Sichuan region, he usually observed the star image to figure out the strategy for using the military force. That’s why the pavilion got the name. In the two stele forests at White Emperor City, you could stroll to appreciate over 70 outstanding works of various calligraphic scripts. And among them, the most famous two are from the Sui dynasty, having a long history of more than 1,300 years. Besides, there are two extremely excellent steles. One is the poem from Tang dynasty hand written by the Emperor Kangxi (康熙) of Qing dynasty; another is a poem carving but looks like a painting of bamboos from afar. All those great works show the brilliant culture and high standard skills of Chinese people in the past centuries. It is regret if you visit White Emperor City but fail to see the Kui Gate (夔门). Situated at the mouth of Qutang Gorge, it is the best viewing place for appreciate the magnificent scenery of this gate. Besides, since on the back of the Chinese note of 10 RMB is the image of Kui Gate, you can take out it to have a picture of the real one with the image on the note. White Emperor City is located in Fengjie County, about 400km driving distance from Chongqing City. For some Yangtze River cruise travellers, you could visit this place during your cruise trip, since the ship will dock at the county for couples of hours for your shore excursion. 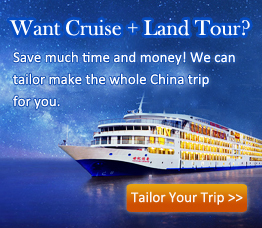 Check which Yangtze Cruise ships visit White Emperor City. And for other travellers, you could take a coach at Chongqing Longtousi (龙头寺) Bus Station to Fengjie for 4.5 hours, and get on a local taxi to arrive at the scenic area for about 25 minutes. Multiple steps to walk: visiting White Emperor City with the main spots on the top of the hill, you need many steps to walk, which needs about 20 minutes or more from the foot to the top hill. Light clothes and a pair of comfortable shoes are recommended. If you are elder visitors or have weak legs, you could choose to go or not according to your physical condition. Coffin Culture: a hall at White Emperor City displays a very ancient suspended coffin, and you could pay a visit to know about the culture of the mysterious hanging coffin of local people in ancient Chinese.